We'd love to have you join our co-op! Unfortunately, we are now closed to new enrollments for Spring 2019, but you can emall carren(at)outlookacademy(dot)com with your name, city, children's names and grade levels for next school year, and we'll put you on the notification list for Fall 2019. We reply via email usually within a couple of hours. In the meantime, you can get an idea of what our fall classes may be like by clicking here to see the current spring schedule. (Be sure to hit Refresh or Reload on your browser for the most updated page.) Most classes will be different for fall, but at least you can get an idea of what we may offer. Click here to read what families are saying about Academy Days Co-op. 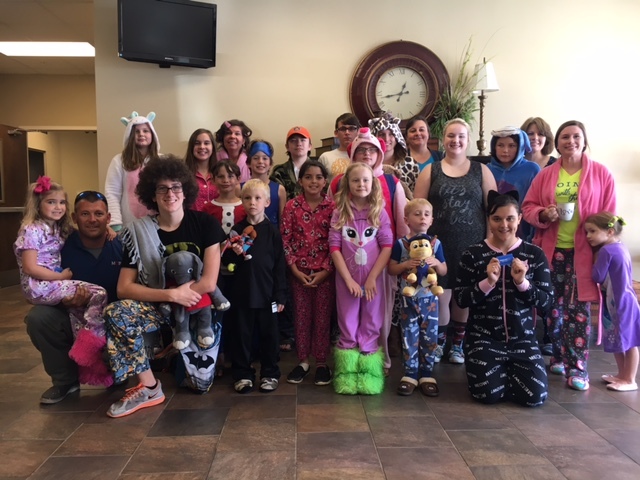 To read about our Pajama Day, click here or click the photo. Academy Days Co-op celebrated its 10-year anniversary back in Fall 2016! Our co-op owes its longevity and success to the Lord, Who works through all the parents contributing their ideas and volunteering their time and expertise every semester. Not every parent teaches a class, and we certainly appreciate those who do teach, but we also value parents who assist teachers, set up, clean up, organize events, encourage and help each other. We parents determine the classes and actually run the co-op. By working together and adapting to fit members' needs, our co-op thrives and all the children and parents benefit! Our members meet for co-op classes on Tuesdays for 14 weeks in the fall and 14 weeks in the spring at Coosada Baptist Church near Millbrook, Alabama, to learn, socialize and support one another. Academy Days Co-op is designed for high school students, but we also include preschool through junior high classes so the entire family can participate. We'd love to have your family join us! Academy Days Co-op is not a church school. If your child is compulsory age, then you must first be enrolled in a church school to comply with state regulations. Although many families in Academy Days belong to Outlook Academy, we welcome families from any homeschool covering. Academy Days Co-op has been serving the homeschool community since the 2006-2007 school year. Since then, more than 75% of our graduates have progressed to college or university (77.7%). We are very proud of our industrious students and dedicated team teachers! Of course, college is not a prerequisite for success in life, and we also applaud those graduating students over the years who have successfully pursued employment, entrepreneurship, missions, or the military instead of college. Our success must be one of the reasons why so many co-ops are following our format and policies. Indeed, we are thankful that other homeschoolers have found our operations to be so useful as to be copied to create their own co-ops. We have been working out the kinks in Academy Days Co-op since 2006. Apparently, by following the Lord's Will, we have done something right, and they think so as well. Imitation is the sincerest form of flattery, and we appreciate the compliment. "Thank you so much for co-op. because of our time spent there." Would participating in a homeschool co-op invigorate or exhaust you and your family at this time in your lives? The advantages and disadvantages of homeschool co-ops should be considered before signing up for any co-op. Please weigh all of them as you prayerfully consider what the Lord may have planned for your family this year.